Despite serving as just a temporary home for the Raiders, Ashland High has been kind to the Southern Oregon women this season; SOU’s average margin of victory in six home conference games is 38.8 points. This weekend’s tilt against Northwest University and Evergreen State was no different, as the lady Raiders won handily both nights, 105–73 and 107–65 respectively. On Saturday, Northwest kept it close in the first quarter, thanks to some hot shooting, but that was when the Raiders’ defense clamped down, a common theme this weekend. The Raiders gave up only 11 points in the second quarter, and came up with 8 steals. 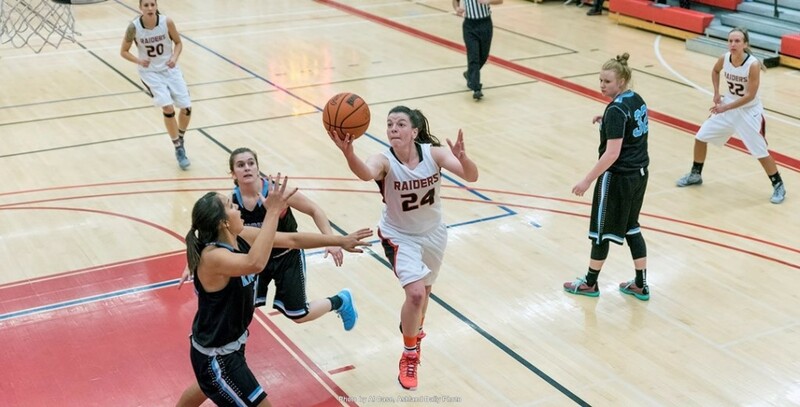 Seniors Ashley Claussen and Carly Meister took over for the Raiders, scoring 13 and 16 points each in the first half. As a result of the defense, SOU extended their lead to 55–33 at halftime. Coach Alex Carlson says the defensive intensity is crucial to the team. “We really try to capitalize on our defense. I thought they made some tough shots in the first quarter, and I think we kind of wore them down, stayed active, and were able to get some steals.” The Lady Raiders took advantage of these steals, converting 16 points off turnovers in the first half. The Raiders were downright dominant in the final three quarters of Sunday’s contest with Evergreen State. After beginning the game 7–7 from the field, the Geoducks were held to 2–16 and five points in the second quarter. Claussen was marvelous again, with 15 of her team-high 17 coming in the first half. The Raiders held a 19-point advantage at halftime, but a 38 point offensive barrage in the third quarter extended the lead to 40, and they never looked back. For the game SOU forced 17 turnovers and scored 41 points off of them, again executing Carlson’s defensive game plan. The weekend moves the Raiders to 18–1 overall and 11–1 in the CCC. SOU goes on the road next, to face off with Warner Pacific and Multnomah.